The boutique Four Seasons Hotel is the ultra luxury Private Residences. It is a 36 high rise condominium project developed by Seattle Hotel Group (SHG). It was completed in 2008 with 149 hotel rooms and features modern homes in Seattle that will truly captivate you with its water and mountain views. At the southwest corner of First Avenue and Union Street, Four Seasons Private Residences is adjacent to Pike Place Market. Walking distance to Seattle Art Museum, Seattle Aquarium, The Waterfront Park and Washington State Ferry Terminal to name a few. 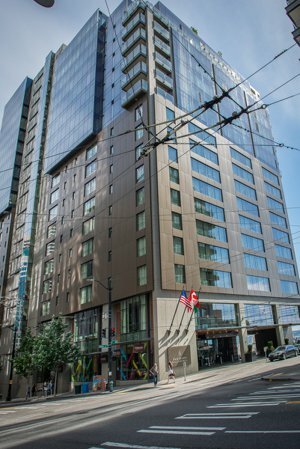 Just a short cab ride away from the iconic Space Needle and Seattle Center. The residential section which includes 30 residential units occupies 11th through 21stfloors. The top-of-the-line finishes, high quality features, details and dramatic courtyard connect to its equally stunning panoramic views. Residents here are offered extraordinary services like 24-hour residential concierge, valet parking, housekeeping, 24-hour room service and amenities like separate private lobby, 6,000-square-foot-spa, fitness center, outdoor infinity pool, access to hotel services. It is also the first hotel in Seattle to feature a fireplace in every room. The roomy floor plans range from 1,300 – 7,500 square feet depending on your lifestyle, be it a primary residence or your secondary home. The condo prices start at about $2M while high end units can go up to$10M or above making it the most prestigious address in downtown Seattle. Four Seasons Private Residences Seattle also boasts a 98 out of 100 Walk Score as many dining, shopping, cultural and recreational venues right at your doorsteps.